One of the main objectives of the project is to initiate the co-creation of alternative combinations of bio-treatment, recycling of high value elements, and combinations for bio-products leading to better commercialization of biotechnology and agricultural products in Europe and India as a basis for Green Growth. 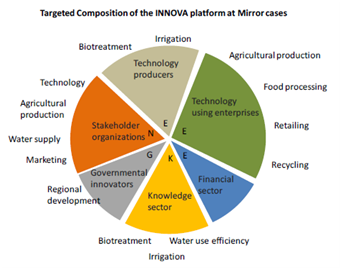 To facilitate this co-creation process, Water4Crops established the“INNOVA PLATFORM”. This platform consists of key stakeholders along the KENGI groups(Knowledge, Enterprises, Non-Governmental, and Governmental Institutions) with specific involvement of innovative key stakeholders from the main areas likei) technology production, ii) technology use, and iii)marketing /retailing. This composition of the INNOVA platform enables a strong interaction of tacit and explicit knowledge and the highest degree of “out of the box thinking” capacity. In addition, cascades of flash-think meetings with smaller subgroups within the INNOVA platform will be conducted. The subsequent co-creation process will include the benchmarking of ideas by Governmental and Financial Evaluators to ensure a true trans-disciplinary approach. Give local impulses for technology use and business development opportunities.